A thorough revision and update of the first edition, this Second Edition is designed to create an awareness of the rapidly developing field of allelopathy. The author appraises existing knowledge in certain critical areas, such as roles of allelopathy in the prevention of seed decay and in the nitrogen cycle, the chemical nature of allelopathic compounds, factors affecting concentrations of allelochemics in plants, movement of allelochemics from plants and absorption and translocation by other plants, mechanisms of action of allelopathic agents, and factors determining effectiveness of allelopathic compounds after egression from producing organisms. Areas in which more basic and applied research is needed are emphasized. A discussion of terminology and early history of allelopathy is followed by a discussion of the important roles of allelopathy in forestry, agriculture, plant pathology, and natural ecosystems. A separate listing of the phyla of plants demonstrated to have allelopathic species is also included. Allelopathy, Second Edition, is a comprehensive review of the literature on allelopathy, integrating information on allelopathy with important information on ecological and agronomic problems, citing more than 1000 references. Among those who will find this to be a valuable source of information are ecologists, horticulturists, botanists, plant pathologists, phytochemists, agricultural scientists, and plant breeders. 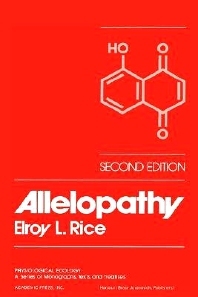 The book is the most important of the branch of allelopathy, every researcher who works in this line of research needs to have a basic contact with this book, besides techniques, theory is of the utmost importance. The University of Oklahoma, Norman, U.S.A.